Visiting an English holiday destination between November and February may seem a bit counter-intuitive, but there are plenty of advantages to an Isle of Wight winter break. 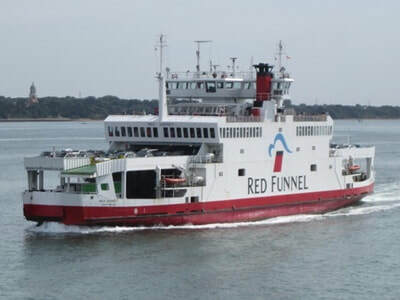 The ferry is usually cheaper, the roads are quieter, some of the parking is free, the accommodation is cheap and those attractions that are open don't have long queues. Some attractions close over Christmas, some close earlier than usual in the winter, so please call ahead if you are making a special journey. Here are some days out, attractions and other ideas of things to do in winter on the Isle of Wight. 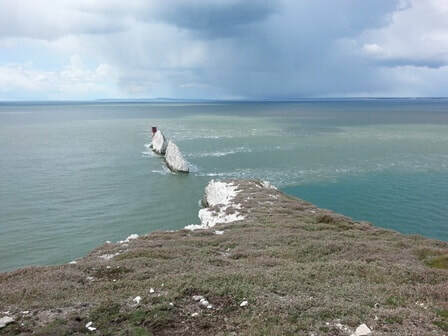 Swimming in the sea around the Isle of Wight in December is less of a pleasure and more of an ice bucket challenge, with polar bears taking a swipe as you practice your backstroke. There are those who swim every day, but these people should be treated with suspicion as they are probably part of a cold blooded species that live under Sandown Pier. We prefer a brisk walk and a hot drink along a seawall. Bonchurch to Ventnor is a good option for wave crashing. Yaverland to Shanklin is nice if you want to see a resort on a quiet day. Cowes to Gurnard is good if you want to look at yachts on the Solent. There's also a nice seawall walk from Appley towards Seaview. The Colwell to Totland seawall was interrupted by a massive landslide in 2012 although it reopened with a 'make do and mend' path in 2015. ​Amazon World (PO36 0LX) offers various slimy creatures to stare at and much of it is indoors and warm. Needless to say, the animals need year round care and attention because as we all know, a crocodile is for life, not just for the summer season. (See our attractions discount guide). 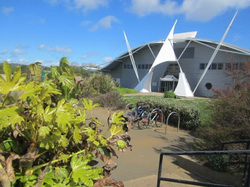 Tapnell Farm Park is great for younger children and has lots to do indoors so you can shelter from the wind and rain. There's a petting zoo and a large indoor play area and coffee shop. I was impressed with Isle of Wight Zoo on our last visit, and Granny Guru says it is much improved since the days when it was described by the Sunday Times as ‘The Slum Zoo of Britain’. It opens with reduced hours in the winter and specialises in big cats. Thanks to car insurance adverts, there is also a meerkat encounter. 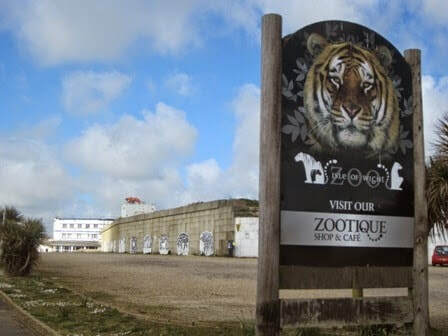 See our guide to discounts to Isle of Wight attractions, which includes Isle of Wight Zoo. Other wintery animal attractions include the Isle of Wight Reptilarium and Terrapin sanctuary, which is part of Fort Victoria in Yarmouth. Where's Yarmouth? Right between your ears, ha! Dainty sandwiches with the crusts cut off are never going to fill you up, but they do provide a nice way to spend a couple of hours in a posh hotel on an Isle of Wight winter's day. 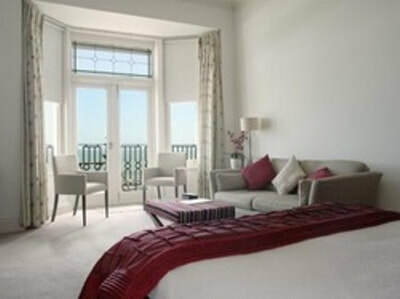 There are several hotels which offer such things in winter on the Isle of Wight. The Isle of Wight has two Roman Villas which are open to the public. The Newport one is pretty small and has limited opening hours, but Brading Roman Villa (PO36 0EN) is bigger and stays open all year round. My Dad always suspected there were Roman remains in our garden, but after professional excavation it turned out that there was just a dead cow and ‘some evidence of Roman latrines’ (that’s old poo to you and me). In summer, the Needles Pleasure Park is a little overwhelming for my delicate persona with non-stop school parties and constantly clanging amusement arcades. 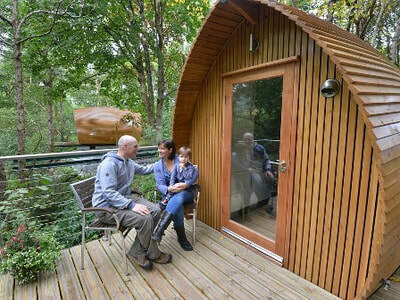 In the winter months, the teacups and other ‘family’ attractions go into hibernation but some of the other things stay open, such as glass blowing and places to eat. It’s a chance to admire Alum Bay and The Needles up close without going potty. It’s actually a stunning piece of coastline. The Isle of Wight’s garlic, lavender and wine producers stay open all year round, presumably because there is always work to be done so it makes sense to keep on selling stuff to visitors. Isle of Wight Garlic and Rosemary's Vineyard are both free, though there are obviously well stocked gift shops. If you fancy a bracing winter walk on the Isle of Wight then you might want to incorporate an historic site like The Longstone or The Pepperpot. They are both stuck in the middle of a field, so technically speaking they are open all year round, even if they are covered in snow in winter. The Longstone is two big lumps of greensand sandstone (nearest postcode PO30 4EA) which are thought to mark the entrance of a 6000 year old burial ground. 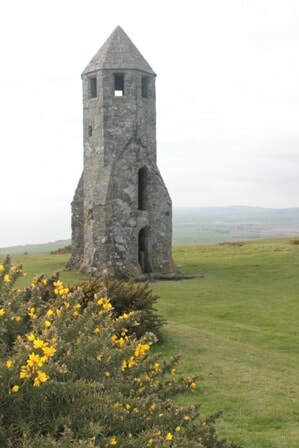 The Pepperpot is the remains of a 14 century lighthouse (nearest postcode PO30 2HN). There’s more on these two, including location maps and their strange histories, in our guide to 25 historic days out on the Isle of Wight. 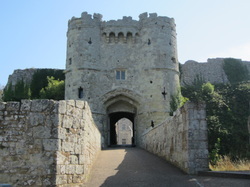 These two English Heritage properties are two of the Isle of Wight’s historic gems. 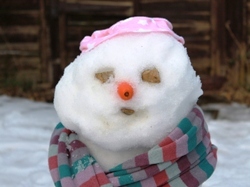 In winter, opening hours are generally limited to weekends. If you have a choice, I prefer visiting Osborne House and Carisbrooke Castle in the summer as a lot of the best bits are outdoors (Osborne Bay is lovely - see our beaches guide). However, visit in winter and you’ll avoid the crowds. Osborne House sometimes puts on special Christmas themed events to make it all a bit more appealing. If you're visiting both during your holiday then it's worth considering English Heritage membership. Two of the Isle of Wight’s Christian communities stay open all year and welcome visitors throughout the winter. 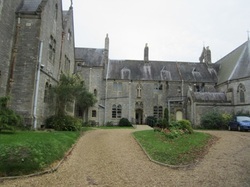 Carisbrooke Priory is largely run by volunteers and has a fascinating history as a former Dominican Nunnery. Quarr Abbey meanwhile is a working Benedictine monastery which sits alongside a 12th century ruin. 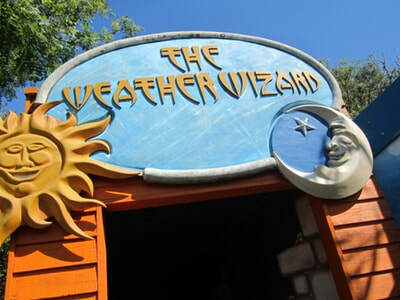 It has a tea garden and farm shop which is open in winter and tours which operate on certain days. You can read more about the history of Quarr Abbey and Carisbrooke Priory in our guide to 25 historic days out on the Isle of Wight. Dinosaur Isle is a showcase for the Isle of Wight's best fossils and bones, but it is very child-friendly with plenty of things to prod, poke and smell. It's a good Isle-of-Wight-winter-activity, although it's not huge so don't plan to spend a whole day there. You can get yourself cheap entry to Dinosaur Isle with a bit of effort (see our guide to discounts to Isle of Wight attractions). The Isle of Wight doesn't exactly have a West End, but there are a pretty decent range of theatres which make for a good way to spend a winter's evening. For a listing of everything happening on one day, try On The Wight's Events guide. Shanklin Theatre - seats 600+, comedy, tribute acts, some drama. 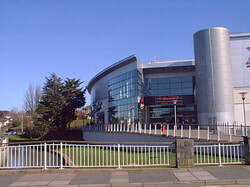 Medina Theatre, Newport - seats 400, local classical concerts, pantomimes, plays, ballet and tribute acts. Apollo Theatre, Newport - amateur dramatics, films, jazz concerts. Ventnor Winter Gardens, seats 400, small number of concerts at the time of writing. Trinity Theatre, Cowes, seats 200, community events and performances. Quay Arts Centre, Newport, seats 130, artsy stuff. Newport Cineworld (PO30 2TA) is a good place to hide from the winter cold on the Isle of Wight. It's got 11 screens, and there is also a Pizza Hut and KFC as part of the same complex so you can make a day out of it. Ryde's seafront boasts a decent bowling alley (PO33 2EL). At the time of writing, the Ice Rink is closed, although in winter you can just put on shoes without any grip and slide around the car park (A&E can be found in Newport). If you're too sensible to swim in the sea during winter on the Isle of Wight (my limits are May to September, with a wetsuit, and I still scream like a girl) then you might consider the slightly warmer public swimming pools. 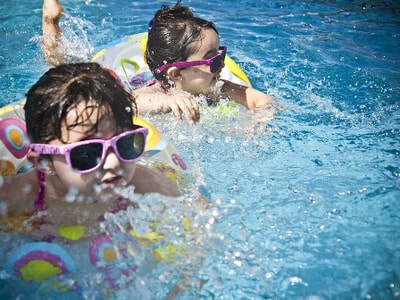 Lots of the caravan sites and hotels have their own pools but there are public swimming pools in Newport (PO30 2DX) and Sandown (PO36 9ET) and West Wight Swimming Pool (PO40 9XH), which runs as a charity. Ryde's Waterside swimming pool is also open, although they presumably don't use the retractable roof so often in December. Or perhaps Scuba Diving is more your thing? As a very general rule, seaside fish and chip sellers close their shutters in winter but pubs across the Isle of Wight stay open. There are loads of really lovely coastal and inland pubs to choose from. If you're after a cheap meal out, read our guide to eating out on a budget. For reviews, take a look at Matt and Cat's Guide or TripAdvisor. 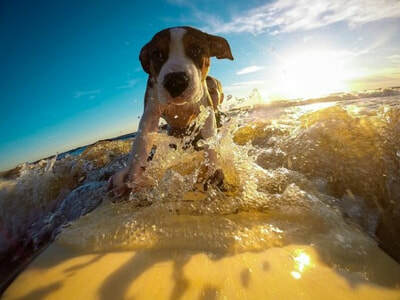 Do you have a problem with too much wind on your holiday? Try kite flying! It won't solve your problem, but it might distract you for a bit. Kite flying is particularly good in winter because there's less chance of running into someone whilst attempt to launch your incorrectly-constructed-heap-of-string-and-plastic. Yaverland Beach (near Sandown). Nice wide open beach with parking, check tide times for the beaches obviously, see our beaches guide for locations. Appley Beach (Ryde). Another wide open beach with parking. Compton Bay. Good at low tide and very picturesque, but not quite as expansive as Appley and Yaverland. Culver Down near Bembridge (try to avoid running off the cliff). Tennyson Down near The Needles (again, try to avoid falling into the sea, your kite won't save you). In the winter months we like to park up in normally busy seaside spots and admire the view with a thermos flask and a piece of cake. Admittedly, that makes me sound like a very boring man...but my wife does make very nice cake. In recent years, the Isle of Wight's Steam Railway has run Christmas Santa specials at weekends and during the school holiday before Christmas. You can have a ride on the steam train, meet Father Christmas and wander round the museum. I suspect most younger visitors are more interested in the meeting-Father-Christmas bit than the exhibition about steam locomotive restoration. What better way to warm up on a winter's day than launching yourself from a trampoline and ploughing face first into a foam filled pit? Isle Jump also has bouncy versions of basketball and dodgeball from its Lake warehouse. It costs about £10 an hour and opens fairly late in the evening (very late considering most of the Isle of Wight goes to bed at 7pm). Sandown Pier is only partially open in winter. The dry end of the Pier continues to serve up chips, 2p machines, arcade games, a cheap bowling alley, minigolf and a soft play area for little ones. The wet end of the Pier which has funfair rides was closed when we visited on a stormy day in winter. I must be the only person in the world who felt nauseous after racing round a karting track. It's amazing that I manage to survive on the Isle of Wight's wiggly roads without feeling ill.
​Wight Karting is open all year round, though it does have reduced hours in winter.